Here’s an unfiltered look at the first half of 2018 – both at the progress we’ve made, and the setbacks we’ve had, and what you can expect from us going forward. LinkedIn founder Reid Hoffman once noted that building a startup is a lot like jumping off a cliff, then assembling an airplane as you’re hurtling towards the ground. In assembling that airplane we’ve had some setbacks, but we’re still very far from hitting the ground. With the benefit of hindsight, there are a few key things we could have done better in the first half of 2018. We’ve learned from those mistakes and have taken steps to make the second half of 2018 a big one for the CoinFi platform. After our ICO we had an ambitious roadmap. We worked hard to execute on that roadmap, but we did make some miscalculations along the way. We tried to build too many features, too quickly, with too small a team. Instead, we should have invested more time into recruiting talent and building the right data infrastructure, even if it meant delaying the initial beta launch. As a result of our miscalculation, the April 6 beta was underwhelming (to say the least) and we had to cut many corners in order to hit the deadline. This resulted in a disappointing product, even for a beta, as well as code and infrastructure that we had to throw out. We essentially had to rebuild after April 6, setting our development timeline back by several months. There were knock on effects as well. Since we were entirely focused on shipping product with limited resources, we didn’t spend enough time engaging the community and maintaining the marketing buzz we built up during the ICO. We did mention last month that we would start rolling out Advanced Token Metrics and the new improved data pipeline in June. It now looks like these features won’t be shipping until Q3. With that being said, things are back on track and looking bright for Q3. We took the time to put together a talented core data engineering and web development team that can execute on our roadmap, established better development processes, and refocused on rolling out one major product initiative at a time. Going forward, we’re also committed to improving communication from the core CoinFi team – especially when it comes to product and development timelines. What Does the Future Hold for the COFI Token? Demand for the COFI token has taken a hit, inline with the broader macro environment: a bearish crypto market. Rest assured we’re still very excited about the future of the CoinFi platform and our vision for the COFI token. We’re rolling out new features like CoinFi News, which will include real-time notifications when hot new ICOs hit an exchange, powered by the infrastructure we’ve already built to connect to exchanges. We firmly believe that our focus on building a great team, delivering a valuable product, offering a strong token utility model anchored by staking-for-access and token-incentivized crowdsourcing, as well as our renewed commitment to growing the CoinFi community will drive demand for the COFI token. We just opened registration for the closed beta of CoinFi News. This is the revamped news engine that will replace the proof of concept we released during the April 6 beta. CoinFi News beta testers will have early access to this new feature and will provide crucial user feedback that will guide product development. You’ll interact directly with the product team to help us build the perfect tool to serve crypto investors like yourself. There are only 500 spots available for the general public (you can move up the waitlist by referring friends), though users who whitelisted during the ICO will be automatically given access. You can help spread the word about CoinFi News by applying to be a beta tester here and sharing your referral link. Let your fellow crypto investors know why you’re excited about CoinFi News! 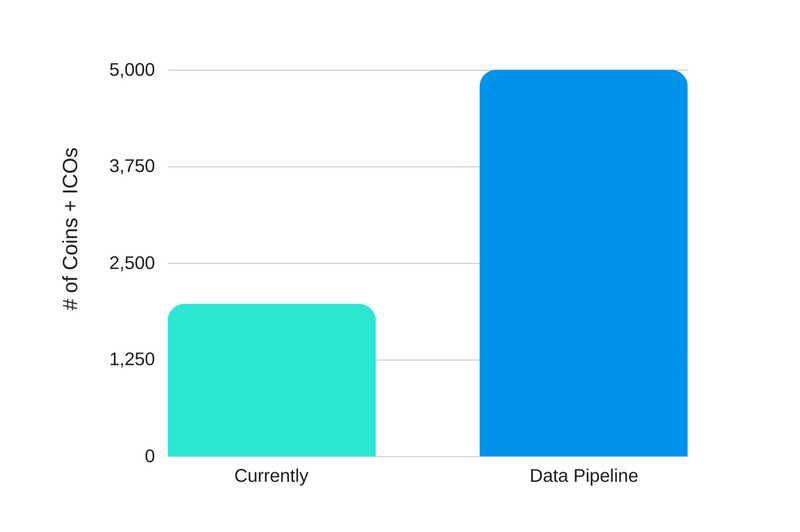 We’re integrating the new data pipeline into the CoinFi platform, but we’re a few weeks behind schedule. It’s currently being tested in our staging environment. So what will this mean for the platform when the new pipeline goes live? Currently we have 1971 Coins and ICOs in our database, and as some of you have pointed out, a good chunk of the data is incomplete or outdated. Once the new data pipeline is in place, you’ll see 5000+ coins and ICOs in our database with accurate, regularly updated data and detailed information. The launch of our new data pipeline will give CoinFi the largest database of Coins & ICOs on the market. Why a podcast? 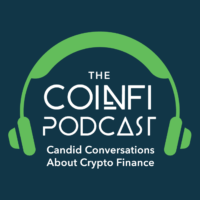 We have a lot of random conversations about crypto in the office and we thought it would be interesting to just hit the record button and share those conversations with the CoinFi community. The idea is that you get to be a fly on the wall in the CoinFi office. We want the podcast to feel like you’re listening in on a casual conversation about crypto among friends. We’ll be rolling out the first few episodes next week. In June, we published four in-depth pieces of crypto research & analysis that got a lot of traction from social media, Reddit, and our own community. While we were looking at some of the news data for CoinFi News, our Chief Data Scientist Alex Svanevik took a look at the how news mentions correlated with trading volume. Another hot topic lately is exchange tokens. After publishing a comparison study on Binance, Huobi, and KuCoin tokens, Alex received many requests to cover additional exchange tokens. So here is an in-depth study on 11 crypto exchange tokens ranked by TVEV ratio. That’s not the end of the series yet. We will be valuing decentralized exchange tokens in an upcoming analysis piece, so stay tuned. We also dove deeper into the utility of the Binance token, and we identified a simple strategy for Binance to double BNB token value overnight. Even Binance CEO CZ tweeted the article. Speaking of CZ, lately he’s had some strong words on Weibo (China’s equivalent of twitter) for one of Binance’s competitors. That exchange traded $17 billion USD in just 24 hours and you’ve probably never heard of it. Give the research piece a read if you haven’t yet, it’s a good one! The last couple research pieces were written by Jonney Liu, our new Head of Crypto Research. Jonney recently joined the CoinFi team to help with trading signal/algo development and to offer his insight into the crypto markets. At the end of June we listed COFI tokens for trading on Cobinhood, the zero-fee exchange. We spent the months after our KuCoin listing focused on growing our team and building product. With a larger team in place, we’ve started dedicating resources again to business development – with the Cobinhood listing being a small first step to kick off our new exchange listing strategy. When it comes to business development there are never any guarantees, but we are actively working on new exchange listings, so keep an eye out for more. As part of our renewed focus on business development and marketing, throughout the month of July, our CEO Tim Tam will be giving talks at different conferences and events in Taiwan, Korea, and Thailand. The goal is to continue building our authority among retail and institutional traders. We want to remind the crypto world that CoinFi is doing big things in the crypto trading space. Here are just a few of the events Tim will be at over the next month. See if you can catch him on the road. Tim is in Taipei in preparation for Asia Blockchain Summit, which will be taking place on July 2 and July 3. If you’re attending the summit, say hi to Tim! On July 19, Tim will be in Seoul at a private event to present the CoinFi project to the Korean market and answer questions from members of the Korean CoinFi community. Back in April, we announced our partnership with HybridBlock to expand crypto intelligence offerings. As a strategic partner, Tim has been invited to speak at Hybrid Summit: The Internet of Value in Bangkok, Thailand on July 28 and July 29. Tim will be giving a presentation on crypto trading and highlighting the strategies of institutional investors. Building a business has its ups and downs, but it’s not the first time CoinFi has encountered setbacks. We also made some miscalculations early in our ICO, but we learned from those mistakes and still hit our $15M hardcap target. Similarly, the first half of 2018 wasn’t always smooth sailing for CoinFi, and we’ll certainly encounter more obstacles along the way. However, what you can expect from us as a team is that we won’t make the same mistakes twice. I wanted to be your investor, but instead, I’ve received your airdrop. I also bought some tokens on kucoin because I believe in the credibility of your team. But I’m a little bit confused. I am a member of icodrops community. They have the best crypto related website, with portfolio, ROI, and some other interesting features. But those guys have done all this without any type of fundraising. So I’m wondering what takes you so long to roll out your project. Don’t get me wrong, I like what you guys are doing just don’t understand the timing.